In Twister, we get to know a community grieving the loss of a young man killed in a war. The story opens with Rose, the soldier’s mother, but then broadens to include a number of other characters—Rose’s estranged stepsister, a neighboring family, townspeople who appear at first glance to be less connected to the loss. What moved you to write about a community, rather than focus on one or two characters? The novel began with Rose. Her voice came to me first. Or rather, her image: a troubled woman haphazardly pruning the shrubs in her yard. There was something she could not bear to face. A struggle that felt elemental. And yet, her energy and voice were so powerful and alive. I wanted to know her more, and understand what had brought her to this point. I knew early on that she had lost her son, Lance, who had been a soldier. The opening Rose chapter stood on its own for a long time. Puerto del Sol published it as a stand-alone story. Eventually I began to write more about the people surrounding Rose. I was so taken with her that drafting the other characters was initially a ruse, a way to keep Rose in my life. Sylvie Brown, Lance’s high school sweetheart, came next and then the rest of the Browns, and then the others. Stella, Rose’s stepsister and closest foil, was the last to appear—I think because I was nervous about getting her right. But finally they arrived, all of them problematic and engaging in their own ways. I suppose I wanted to explore how a community copes with both momentous loss and the daily vicissitudes of love and betrayal and misunderstandings. The weird work of living together and being responsible for one another; failing each other almost inevitably, but trying anyway. The book has major external pressures: the loss of Lance and the storm that’s bearing down. But the undercurrents intrigued me just as much. I wanted to know more about the painful rift between the stepsisters, Rose and Stella; and why the Browns, her neighbors, hold such a grudge; and what Sylvie knows about Lance that his mother may not. What do these people—some near and dear and some estranged—see in each other that they might not be able to face in themselves? And how does what is seen tell us as much about the perceiver as the perceived? This is connected to why I write in the first place. Why do we bother to write and read fiction? Lots of smart people have attempted to answer this. For me, it’s a question that cannot be answered except by another question: How do you make people see that everyone’s story is now a part of everyone else’s story? (I stole that line from Salman Rushdie). Art at its best opens an interior door to something essential. I think it can dissolve boundaries between people, and between now and then and what could be. It locates the familiar in the unfamiliar. Or maybe it just reminds us that the unfamiliar is a valuable place to be. 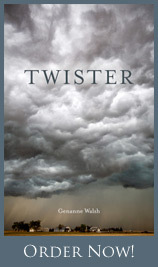 Characters in Twister include the middle-aged stepsisters, Rose and Stella, a teenage girl, an old farmer and his taciturn son, a town gossip, a closeted gay businessman, a socially maladjusted shoe salesman … They are connected by place and circumstance but are otherwise dissimilar. Which character is closest to you? Is there one that you root for the most? There is no template of me in the book, but of course parts of me are in each of them. I recognize Old Man Brown’s pride and missteps, Stella’s follies, Nina Brown’s practicality and awkwardness, Ward Mondragon’s misguided faith in his own façade, and Sylvie’s hopeful yearnings. Rose I am in awe of and very unlike, but the way she is buffeted by waves of great emotion is familiar. I was in my mid-twenties when my mother died after a brief illness and I was spectacularly unprepared. I did not know that grief is physical. I did not know that it feels like a wall coming down between you and the world. Words failed. My mother was a very quiet, shuttered person and if it’s possible to say this about a person who raised you I can say it of her: I did not know her well. And that did not matter—if I’d expected some movie-of-the-week weeping and a sedately paced coming to terms, that illusion imploded. I was enraged. I was unpleasant to be around at just about every level. How dare the world go about its business as if nothing had happened (“Stop all the clocks, cut off the telephone…”)? The only things that felt right were sleeping and moving swiftly, moving too fast to speak to anyone. Grief is isolating by its nature (maybe just in our culture … or just in my family?). I think this has to do with separation from the beloved. And like falling in love, grief can make for a very self-involved, blindered experience. Being a reader, I turned to books. First it was to the self-help section, which was initially useful but didn’t go far enough. Poetry brought comfort and the kind of imagistic, open-ended reading experience I needed; and poetry (bless it!) will go as far as you need it to. A very kind coworker gave me a copy of Banana Yoshimoto’s Kitchen and that fed something important. It’s not a coincidence that this is the period when I wandered into my very first creative writing class, at UC Berkeley Extension. I didn’t wander, let’s be honest. I was propelled. In writing Twister I was interested to discover that no one here is “the hero,” no one more deserving of happiness and peace than any other. All of them are flawed and have the capacity to transcend their limitations, albeit imperfectly and fleetingly. Stella betrays Rose very clearly, that age-old romantic transgression—but Rose betrays Stella in turn, by shutting her out. Louise Logan, who began as a sketch of a disagreeable gossip, is in her own way quite heroic at the end. How can we be so in need of one another and yet so fragmented and desperately singular? Does our subjectivity doom us? Writing the book was a way to turn these questions over in my mind. And I like my mind better when I’m writing. Writing accesses something that exists, ironically, beyond words. Maybe another way of asking which character I root for is, which character did I write the book for? I’ve never been a writer who keeps a specific audience in mind while drafting. But I have high hopes for Sylvie, Lance’s friend. I think she would “get” the book. I like to think of her lying on a beach reading it, occasionally nodding or dog-earring a page and then setting it down to go take a swim. The storm plays an important role in Twister. We get to know the characters in part through their reaction to the tornado and its aftermath. How did this arise? I think of the storm as a character in its own right. It came, like the rest of the book, through Rose. In a way, her psychic extremity summons it. It could be an extension of her mental state. But it is also very real and external and too big for her to handle—she’s at its mercy and in its grip. Or you could chalk it up to my childhood love of The Wizard of Oz. My lifelong love of The Wizard of Oz! I don’t mean to sound dodgy—or lighthearted about disastrous natural events—but the exact nature of the storm is a mystery to me. I do think climactic weather mirrors the soul of our times, and I’m not just talking about climate change. The sky or the life that changes in an instant. I haven’t lived through a tornado but I spent nine formative years in Florida; I’ve known hurricanes. I’ve lived in earthquake country for more than twenty years. I worry endlessly about the precarious state of the world and our human predicament. Writing lets me gnaw on that dread while simultaneously (when the groove is good) suspending me outside time’s pull. I’m just a body in the moment trying to find the right note. The twister helped me find the structure of the book, incidentally. I realized at some point that the novel could fall into three distinct sections shaped by the storm—the day leading up to the tornado experienced from the vantage points of the various characters; the history of the place and people as revealed through the storm’s eye; and finally the aftermath, picking up whatever pieces are left and moving on. A question that intrigued me as a writer (and I hope will bring suspense for readers) was, will they survive it? If so, will they be changed by it? And what brought them to this particular time and place, this point of extremity? What does the storm “mean” as a fictional element? Who am I to say? Something different to everyone, hopefully. What role do current events play in Twister? In particular, the Iraq and Afghanistan wars. There is a war in the novel, of course. That’s how Lance is killed. The war isn’t named in the book but I felt the pull of current events (how could I not?) when writing. Rose first appeared on the page in 2002, during the long, inexorable build up to the U.S. invasion of Iraq. It was a way to grapple with what was happening, and with what was to come. In the book the war operates off the page but its impact is central. It’s not a work of reportage, not even close. As I wrote I was interested in how far away the real wars, Iraq and Afghanistan, felt. Very little sacrifice required of people not directly affected by serving or by a loved one’s service. How can this be? How can something so monumental feel so far away, even unreal? Where are our ration cards? It’s easy to convince ourselves that we are unaffected. But we are affected. Walking around as if we aren’t is delusional. Like all delusions, it comes at a cost. Lance’s voice appears at one point. Did inhabiting the point of view of someone dead reveal anything surprising? For most of the book, Lance is present through his absence. At a certain point his silence felt unfair. I wanted to see if I could bring him in, reveal a voice that was his and also more than his. You set Twister in the Midwest and yet you have never lived in the Midwest. True. I’ve never lived on a farm, either. Though an uncle had a dairy farm in Culpeper, Virginia that I used to love to visit. I’m not in the “write what you know” camp. My fiction is never overtly autobiographical. I think this might be an innate tendency, like right- or left-handedness. It may open me up to suspicion from readers who prefer a very fact-based fiction experience. But I take comfort in the fact that a true master of the craft, Toni Morrison, once said, “Do not write what you know. Think up something else!” The world is big and my life is relatively small. I’m trying to write my way toward an understanding of the big. I should also say that having lived on both coasts I have an outsider’s awe of the Midwest. I have no illusions that Twister is a realistic depiction of a particular place. It’s my mythic version of the heart of the country. Twister’s setting doesn’t exist on a map; but I could draw one for you if you wanted. The heart is the reason. I can say that now with the advantage of hindsight. But it wasn’t planned. I didn’t place Rose in the middle of the country—she appeared there, at the center of things, hacking at the bushes in her yard. How did you find out that the book won the Big Moose Prize and would be published by Black Lawrence Press? I got a call out of the blue from Diane Goettel, the Executive Editor. I was completely floored. Apparently an email had gone out with a list of prize finalists but I’d missed it and had no idea I was even in the running. I asked Diane half a dozen times, “Is this real?” She patiently assured me that it was. Then I called my wife at her office. Then I walked into the backyard and stood there dumbly for several minutes, or maybe much longer. Then I shared the news with a few writer friends, in an email with a subject line that could be categorized as Ecstatic Profanity. And then I went for a walk with my dog. Let’s move on to less serious questions. What are your writing habits? Early morning. I have cultivated extreme inefficiency in my writerly habits. I write by hand in a very particular notebook with a very particular pen, at a specific desk. Then I type it in and print it out and edit and generate more via pen, ad infinitum. I really do recommend handwriting, though. In my day job as a writer/editor it’s all business, very screen-based. Maybe because of this, writing fiction by hand is the best way to temper the critical brain. However, it has taken a toll: my script looks like I’m a serial killer who spent fifteen years in medical school. Think Dr. Jekyll scribbling in his dream journal whilst transforming into Mr. Hyde. Are you a woman writer? A queer writer? A West Coast writer? An Irish-American writer? A frequently disgruntled and bewildered writer? I am a writer. We contain multitudes. Does that sound flip? Identity matters. I proudly claim all of the above. It’s formed my work, probably in ways I can’t even see. But I think a lot of writers get squirrely when asked the category/identity question because underneath it another question often lurks: Which subset of like-minded, familiar-looking, similarly-experienced people might enjoy your work? To my mind, the best art traverses boundaries. Or attempts to. I’m talking about boundaries within the artist as well as between the work and the reader. That’s what keeps me reading books and going to plays and checking out art galleries, that sense of an artist reaching beyond themselves. And that feeling that a work is talking directly to me, but a much bigger me—less predictable, more exploratory. Well, okay. Are you one of those superstitious writers? What do you mean? I’m just throwing salt over my shoulder because I love salt. (See above re particular pen and paper….). They live in an antique soup ladle I bought at an overpriced used cookware shop run by a preposterously peevish proprietress. It’s located on Divisadero Street in San Francisco. I recommend a visit. Hummus. My life would be sad and empty without hummus. Vampires—I just don’t get the zombie thing. But these are silly questions. Did you put any thought at all into this or are you winging it? It’s impossible to have “favorite” art, I think. It’s too mutable, too dependent on mood and hunger and who you are when you meet a particular work on a particular day. But right at this moment, these writers spring to mind. Their work has moved me, maybe even improved me. Toni Morrison, Louise Erdrich, Merce Rodoreda, William Maxwell, Melanie Rae Thon, Adrienne Rich, George Eliot, Edward P. Jones, Edith Wharton, E.M. Forster, Zadie Smith, Kathryn Davis, Marilynne Robinson, James Baldwin, Anne Carson, Arundhati Roy, Lynda Barry, Tove Jansson, Michael Ondaatje. This list will evolve until the day I die, I hope. Aaargh. Are you trying to kill me? I really love Terrence Malick. Recently, I’ve loved Ida and Selma and Beasts of the Southern Wild and The Great Beauty. Terry Gilliam’s fun. Jane Campion, Errol Morris, Kelly Richardt, Todd Haynes, Lynne Ramsay, Hayao Miyazaki, Sarah Polley, the Dardenne brothers, Federico Fellini, Mike White, Lisa Cholodenko. Best in Show is up there. The Wizard of Oz, of course. Best species on the planet. Thank you for that very thoughtful question. It’s pronounced Jean-Anne, an amalgam of my parents’ names and spelled creatively. I know. Tell me about it. For the record, I think that in his nervous excitement at the hospital while filling out the birth certificate form, my father forgot to include a middle “e.” He’s actually a good speller otherwise. My name has caused no end of irritation over the years (mispronunciation, misspelling, angst over parental cluelessness, etc.) and yet it is mine and changing it or modifying it has never felt right. Plus, it made buying my domain name a snap. Not too many Genannes wandering the world. What would your name be in an alternate universe, if you could choose it? Marian Leatherby. (One of my favorite fictional heroines. I should have mentioned The Hearing Trumpet in that book list up above). That’s it for now. Thanks for your time.